Last night a new Mister Switzerland was chosen in a live TV-gala event televised in all parts of Switzerland. The winner is 27-year old Miguel San Juan. He is a student of economics and comes from Fribourg. He is the first Mister Switzerland ever who comes from the French-speaking part of Switzerland. 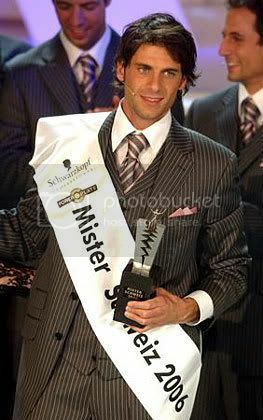 The new Mister Switzerland stands 191 cm (6`4") and is expected to compete in Mister World 2006, in Sanya. [> [> Subject: What a gorgeous man! [> Subject: He is a tall, handsome hunk, he looks good.